I had a large pile of crumb blocks that desperately needed to find a quilt home. These blocks have been sitting on the shelf in my studio for years collecting dust. As we all know, blocks on a shelf do not do much for warming a body or soul. So, recently, I took that stack of 40 crumb blocks off the shelf and transformed them into two large lap size quilt tops. (62″ x 74″). 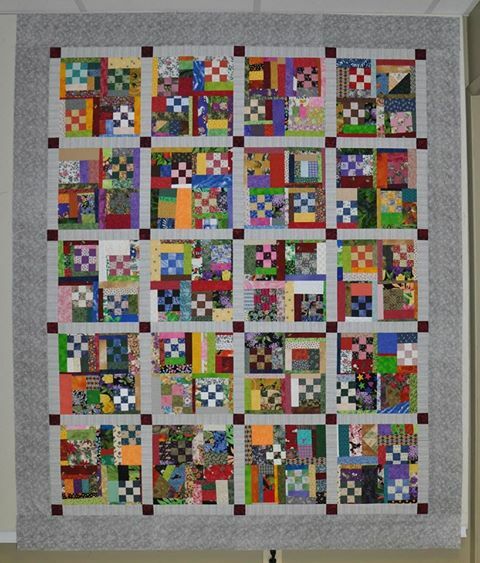 At one point I had all 40 blocks sewn together into one large quilt top without sashing and cornerstones. I wasn’t happy with the chaotic look of that top and so I picked out the seams and stacked the blocks back on the shelf. The blocks sat for a few more years without being touched because of the memories invoked by all that reverse sewing that I did! Each crumb block is pieced together from 4 smaller, 6″ square crumb blocks. There is everything in these blocks–nine patches collected from a guild nine patch block exchange many years ago, scraps of fabric from leftover quilts made for Christmas, Valentine’s, Easter, floral, and other themed quilts. These quilt tops are truly a trip down memory lane. It always surprises me how much emotion and memories can be triggered by looking at the scraps of fabric in one of these quilts. 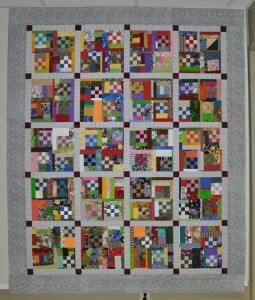 This entry was posted in crumb quilt, flimsy, nine patch, scrap by Norma Hanson. Bookmark the permalink. I just love your crumb quilts and their story. all those little ninepatches. Awesome! 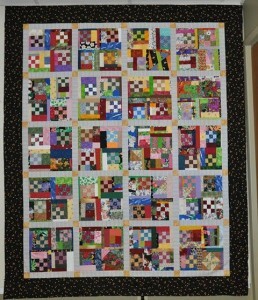 Great crumb quilts , have never made one but they look like fun visiting through the blog hop , great blog . Love your crumb blocks. I have never heard that term before, thanks for the new quilt idea.